Greetin’s, me mateys. 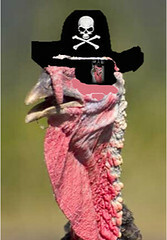 This is yer favorite pirate turkey, Planksy, gobbler aswayin’ leeward, sailin’ into Oklahoma to deliver me annual dranks and planks. If yer done good, yer get dranks straight from me own personal rum barrel. (Ho ho ho. Aye, maybe we’ll get out the hornpipes and jig the night away!) If yer done bad, then yer gets to walk one of the planks off me fowly vessel and swim with the hungry fishies. Arrr! I’ll decide. Planks: Aye, planks go to none other than those landlubber Oklahoma voters who approved some of the swarmiest laws ever concocted in pirate history. So, aye, Sharia law is outlawed in the courts, the state is strictly speakin’ English-only-no pirate turkey talk in official documents, can you believe it, lads and lasses?-and, me mateys, the state wants to throw federal health laws overboard, and it’s all for a big blarmey of lily-livered nothing. Dranks: Me mateys, state Sen. Andrew Rice put up some big numbers in his reelection, and he gets me dranks for that and for speakin’ up for besieged Democrats here. Aye, his district, the fightin’ forty-six, is a proud ship surrounded by a red sea. He’s the underseadog, alas, but, blarmey, ho ho ho, me fellow pirates, that ship shall sail in blue waters again, it shall sail in blue waters again. Hmmm. Planks: Me special planks go to the Oklahoma weather for its rascally blizzards, scurvy hail storms, and yer run-for-yer-lives tornadoes. Aye, me vessel was stranded and damaged, me gobbler weary with cabin fever, me pirate turkey heart pounding as sirens screamed. Arrr! The weather here is a fat bilge rat. Walk the plank! Dranks: Share a cup of me rum with none other than Brittany Novotny, who ran a positive campaign against state Rep. Sally Kern. Brittany wanted to stick to issues, but Kern and friends yapped their holy-roller mush scurvy style. Cheers, Brittany. Aye, matey, we need you here. From the bottom of my giblets, I want to wish you all a bounty of tofurkey this holiday. Arrr!